As a coach, I provide endurance training designed around your lifestyle, athletic history, goals and budget. l work with endurance athletes of all abilities and distances to help them reach their goals. Please contact me for a free consultation. 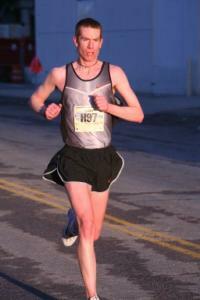 I have been an endurance athlete for over 20 years. I started with running local road races (5Ks and 10Ks). After several successful seasons, I decided I wanted a new challenge and “moved up” to marathons. I have since completed more than 10 marathons including Boston, Chicago, New York and CIM and have a 2:48 PR. Desiring another challenge, I “moved over” to triathlon and applied many of the same endurance training principles I learned in running across the three (3) disciplines (swim, bike and run). I felt I had a successful transition (pun somewhat intended) when I became an Honorable Mention All American triathlete. The next challenge I set for myself was coaching. To start, I coached myself as well as some friends & family to various PRs and new levels of fitness. In 2010, I obtained my USAT Level I Coaching Certification, and I am now coaching age groupers of all abilities and spreading the word about good health. Success. Coach Max Spradley has been notified of your message. To hire Max Spradley as your coach, select the coaching service that is right for you.